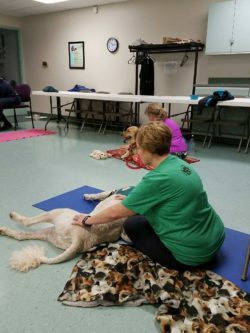 Maverick and I did a Doga class with N2Paws . We had a blast and were very relaxed afterwards. You may be wondering what is this Doga stuff? Doga combines massage and meditation with gentle stretching for dogs and their owners. Both you and your pet will benefit from practicing this mindfulness-based exercise together. Doga will improve your posture and help you to sleep more soundly. Your dog will benefit from increased circulation, relaxation, calmness and, of course, the time spent bonding with his favorite human. You can also do yoga with your cat. A little more challenging unless you have a really mellow cat. Cats can have similar benefits to what dogs receive.